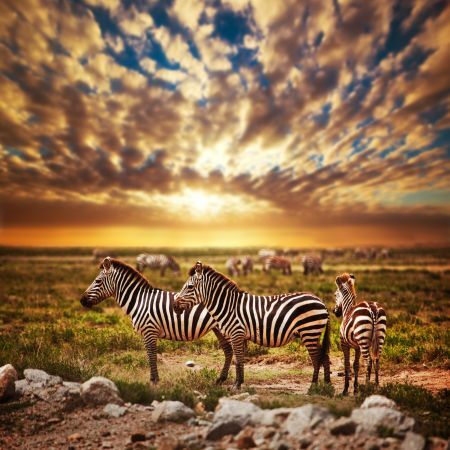 Tanzania is generally recognised as being an ‘all year round’ safari destination, with particular emphasis being during the first couple of months of the Great Migration. Being close to the equator, temperatures are fairly constant throughout the year, but there are still some months that are characterised by rain or humidity. Zanzibar and the coastal regions are particularly appealing during the June to August period when temperatures are a little lower (although average highs are still around 30°C), and there is usually much less rain than at other times of year. January and February are also quite dry, although it can be humid and temperatures average around 33-34°C. The main rains fall in March, April and May, where heavy tropical downpours in the afternoons are a regular occurance, making some roads impassable. What with the high humidity and daily temperatures that can reach 35 degrees C, and the fact that these months tend to be classed as a high-risk for malaria, the lodges offset these negatives with lower rates to try to attract more visitors. The scenery is stunningly green and lush – which whilst wonderful as a backdrop to your safari shots, it does make spotting the wildlife in the thick bush slightly more difficult! It also normally rains again during November/early December, but the rain that does come down tends to be less tropical and heavy – rather, the pattern tends to be short, fresh downpours followed by clear skies and sun. From June through to the end of October is the long dry and relatively cooler season. The chances of rain are highly unlikely, and the temperatures are less humid, making these months a truly lovely time to visit the country. The vegetation dries out, making it easier when out on game drives to track the wildlife, plus the animals are more dependent on water holes and riverine areas so game viewing around these areas is particularly rewarding. Mid to late December through to February are also dry months, but the weather becomes increasingly hot and humid. In particular, Christmas is also a very popular time for visitors, so if you are planning on travelling over these months, do be prepared for high rates and please ensure that you book well in advance or else you may find that your first, second, third or even fifth choice of accommodation is not available.